Mortise-and-tenon joints are among the strongest joints in woodworking, and are used for projects that have frame construction and need to be strong. Chairs and tables use them as does most Arts and Crafts and Mission style furniture. Mortise-and-tenon joints come in several types — stopped/blind, through, angled, wedged, and many more — but they all consist of the same basic parts: a mortise (a recess cut into a piece of wood that accepts a tenon) and a tenon (a tongue at the end of a board that fits into a mortise). Here’s an introduction on how to make three of the most common mortise-and-tenon joints — stopped, through, and angled. You can make any of these joints with one or a combination of techniques. If you end up doing much woodworking at all, you’ll quickly become an expert at making these joints regardless of how you do it. 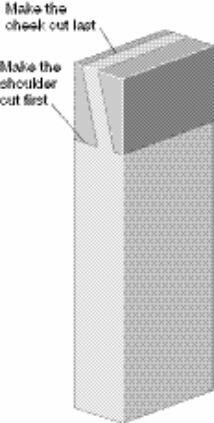 Tenons can be made with or without shoulders (a squared off notch on a tenon; see Figure 1). Which way you choose to do them depends on the design of the piece and your skill at making the joints. Hint: A shouldered tenon can hide less than perfect joinery. 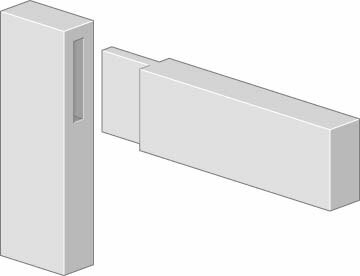 Figure 1: A tenon can be made with (left) or without (right) shoulders. A stopped (blind) mortise-and-tenon joint is one in which the tenon is hidden fully in the mortise (see Figure 2). This type of tenon is often used on table and chair legs or anywhere else that you don’t want to see the joint. Figure 2: A stopped mortise-and-tenon joint is commonly used for chair and table legs. 1. Mark the mortise on your board. 2. Choose a mortising bit that matches the width of your mortise as closely as possible (without going over). 3. Set the fence so that your workpiece is positioned correctly under the bit. 4. Set the depth of cut on the tool. 5. Drilling slowly, make your first hole at one end of the mortise. 6. Make the next pass at the other end of the mortise. 7. Overlapping by half the width of the bit, drill/chisel out the rest of the mortise. 8. Clean the hole up with a chisel if necessary. This will depend on your bit and the model of tool you have. Some cut cleaner than others. For mortises that are wider than your bit, you need to repeat this procedure after adjusting the fence to clean out the rest of the joint. 1. Mark the cut on both sides of the board to be tenoned. 2. Set the depth of cut to the thickness that you want the tenon in the center of the board. 3. Using your miter gauge, line up the cut and feed the wood through the saw. If your tenon is longer than your dado blade is wide, you’ll need to make more than one pass. 4. Turn the board over and do the other side. 5. Clean up the tenon with a sharp chisel. If you want to include a shoulder on the tenon, repeat this procedure only put the board on its edge instead of its face. Be sure to reset the depth of cut for the shoulders. A through mortise-and-tenon joint is essentially the same as the stopped mortise and tenon except that the tenon goes entirely through the mortised board to be revealed on the other side (see Figure 3). The through mortise and tenon is a staple of Arts and Crafts furniture from the early 1900s. Figure 3: A through mortise-and-tenon joint is one of the most beautiful joints that you can make. The following steps show you how to make this joint with a drill press and chisel and a table saw using a tenoning jig. 2. Choose a drill bit that matches the width of your mortise as closely as possible (without going over). 7. Drill out the rest of the mortise by setting your bit next to the previous hole and progressively moving toward the first hole you drilled. Don’t overlap the holes because this puts stress on the bit and creates uneven holes. 8. Clear out the rest of the wood in the mortise with your chisel. If you don’t have a tenoning jig, follow the steps for the stopped/blind tenon to cut a through tenon on a table saw. 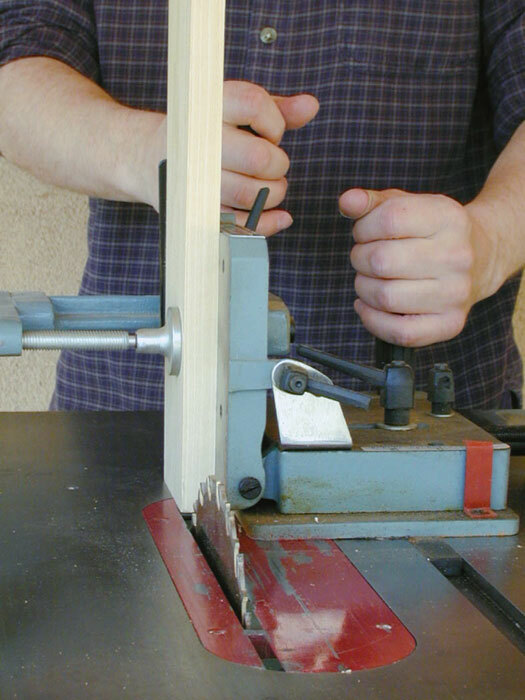 Figure 4: A tenoning jig makes cutting tenons really easy. 1. Mark your board for the cuts. 2. Set the depth of cut for the tenon. This is generally 1/3 of the thickness of the board. 3. Using the miter gauge in the left-hand slot, run the board through the saw to cut a single-saw-blade-wide cut at the mark. 4. Turn the board over and cut the other side. 5. Take your miter gauge out of the miter slot and replace it with the tenoning jig. 6. Clamp the board vertically in the jig. 7. Raise the blade to the height of the tenon. 8. Run the board through the saw (refer to Figure 4). 9. Turn the board around and repeat the process. 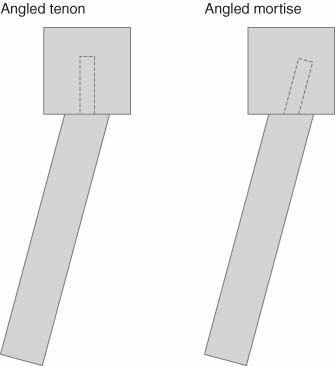 An angled mortise and tenon is commonly used for chairs because the rail comes out of the leg at an angle (see Figure 5). However, this angle makes the joint tricky. You can create an angled mortise and tenon in two different ways: by angling the tenon or by angling the mortise. Which one you choose will depend on your style and the project you’re working on. This section explains both of the options. Figure 5: An angled mortise-and-tenon joint is often used for chairs. With an angled tenon (left), with an angled mortise (right). You don’t need to angle both the mortise and tenon, just one or the other. 1. Mark your tenon as shown in Figure 6. Figure 6: To make an angled tenon, cut the shoulders first and the cheeks next. 2. Cut the shoulder cuts first using a handsaw. 3. Cut the cheek cuts (the wide sides of the tenon). 1. Place the piece to be mortised on an angled piece of wood and clamp it to the bench. 2. 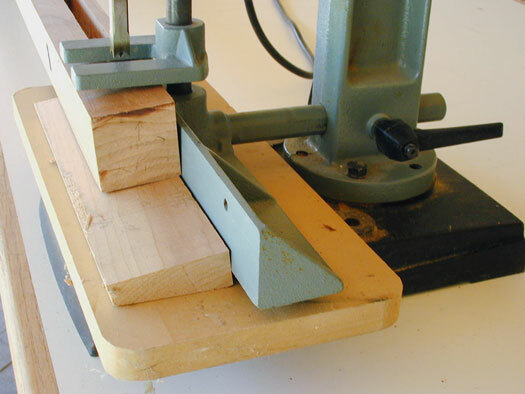 Cut the mortise as you would cut a regular mortise, with your chisel, drill press, or benchtop mortiser perpendicular to the table (see Figure 7). Figure 7: To make an angled mortise, support your workpiece at an angle and cut as usual.